Relations between automakers and suppliers are deteriorating largely because of intensifying cost-cutting demands, according to a report. Vehicle manufacturers are looking for annual price decreases as high as 10 percent, partmakers revealed in the 2014 Global OEM-Supplier Relations Study conducted by IHS Automotive. “With few exceptions, even the best-performing carmakers have become more stringent on controlling costs in 2014, signaling a general shift for the automakers toward greater cost focus and more aggressive ways to capitalize on their negotiation leverage with suppliers,” lead author Matteo Fini said in the report. The standard annual price reduction by automakers is about 2 percent to 3 percent, but IHS says it is not uncommon for them to seek cuts of 5 percent or more. “Suppliers seem to accept the notion that they have to find innovative ways to generate savings on a year-over-year basis. However, they find it difficult to accept that they receive little or no support from the OEMs in doing so. This lack of support often results in strained relations between the two parties,” Fini said. He said those savings are not always being pursued collaboratively. “Expanded product liability guarantees, attempts to put more of the financial burden of recalls on suppliers and such ‘nitty-gritty’ factors as reduced levels of compensation for raw material cost variations and reimbursement on tooling are also having a negative influence on the supplier-OEM relationship,” Fini said in a phone interview. “In some commodity type areas, OEMs are becoming much more demanding. They clearly consider their bigger platforms lead to higher volumes and this gives them much greater leverage with suppliers,” he said. He highlighted Volkswagen Group and Renault-Nissan as two automaker groups identified by suppliers as being particularly demanding. The annual report also names the top automakers to work with based on feedback from suppliers. Toyota tied for first with BMW, both earning 627 out of a possible 1,000 points. BMW, however, was the more consistent performer of the two across regions. It took first place in North America and second in both Europe and Asia, making it the only automaker to secure a top-three position in the world’s three largest markets. The top two, however, did not score as well as they did last year. Both BMW’s and Toyota’s global ratings remain significantly below their SuRe index scale highs (712 for BMW in 2006 and 697 for Toyota in 2007), providing further confirmation of deterioration in automaker-supplier relationships. There were some winners in the latest index. With a 16 percent improvement in 2014, Jaguar Land Rover established itself as the “most trustworthy” automaker. It offers, for example, a more comprehensive protection of its suppliers’ intellectual property, according to the report. Another winner was Chinese manufacturer Great Wall Motors, which improved 47 points to 518, putting it just behind VW brand (525) and Hyundai (524). Suppliers are less confident than they had been about their opportunities to expand their business, expressing particular concern about future opportunities with Hyundai-Kia and VW Group. IHS forecasts suggest that compound unit sales growth for these two automaker groups will drop from double-digit figures seen in 2009-2013 to low single digits in 2014-2018, “corroborating the idea that the bonanza years for suppliers exposed to these customers could be soon drawing to an end,” the report said. 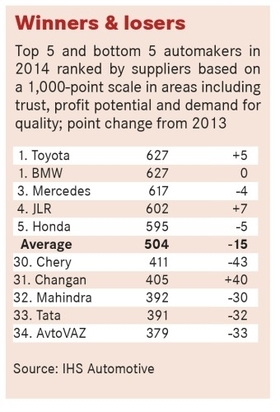 Ranking at the bottom of the index were India’s Mahindra & Mahindra and Tata, along with AvtoVAZ of Russia. Each earned less than 400 points, well below the industry average of 504. Suppliers also identify automakers’ as having what IHS terms a “lukewarm” response to global recalls and quality management troubles. “Recent recall fears do not seem to have translated into greater attention to in-bound quality,” Fini said in the report. “Suppliers have indicated that all carmakers, apart from Subaru and a few of the Chinese manufacturers, have actually become more lenient with regard to quality in terms of PPM levels, testing requirements and product or process validation. Even best-in-class carmaker BMW seems to have backtracked on this point compared with last year, with lower ratings of quality demands,” he said.